Achieving the perfect eyebrow shape is the holy grail of beauty – take control with these must-have tools. Your eyebrows frame your entire face and can change your look in an instant. To get the shape you want, we recommend you start of with a trip to the beauticians. Plucking, waxing and threading can all be used by a professional to get a natural and defined shape that suits your face. A helpful piece of equipment you can use daily to keep unruly hairs in place. Use the brush to push hairs into place and then use the comb to separate any clumped mascara on your eyelashes to keep your entire eye area looking its best. In between salon visits these slanted tweezers are fantastic for plucking out any stray hairs. Tending to your brows every day will mean you are only plucking one or two hairs a day instead of one big job at the end of the week. 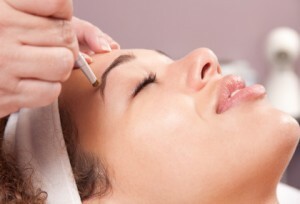 Try to incorporate eyebrow maintenance into your daily routine. If you are creating your brow shape at home, this stencil kit from Shavata could give you a helping hand. The kit includes multiple eyebrow shapes to choose from and different coloured brow pencils. Pick the shape you want and use the brow pencils to stencil in the shape onto your brows. Then all you need to do is use your tweezers to pluck any hairs outside of the stenciled shape and use the pencil to fill in any sparse areas. Fantastic for those who have over-plucked in the past or those keen to thicken up the appearance of their brows, the Brow Kit from Bobbi Brown is a duo of powders that will define your look in a natural way. Coming in light and dark shades, the kit also includes a magnified mirror and mini tweezers to help you maintain your brows. If you want to find out more about eyebrow treatments and find a beautician near you, please see our Eyes and Brows page.